Milton under Wychwood and The Great War Exhibition will be in Milton church from 1 to 11 November. From Thursday 1 November there will be a display in Milton church to commemorate the 100 years since the end of WW1 with details of all the men, mentioned on the village war memorial (which is in the church) who perished in the war. There will also be the opportunity for anyone to place a named poppy on a display in remembrance of any relative or special person who was a victim of war. 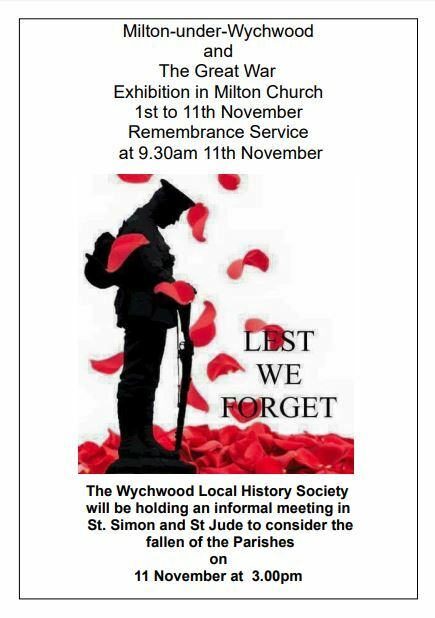 Also, the Wychwoods Local History Society will be making a special visit to Milton church at 3pm on Sunday 11 November to view the exhibition and commemorate the fallen.